Here I am in my kitchen on the first really frigid day we’ve had. The wind is blowing and there’s a light cover of snow on the ground. We’re in for some bitter cold weather…..the Canadian Clipper has arrived. (Canadian friends, thanks a bunch!). I’m going to indulge myself today and wear my warm leggings, a sweater, heavy socks and slippers. 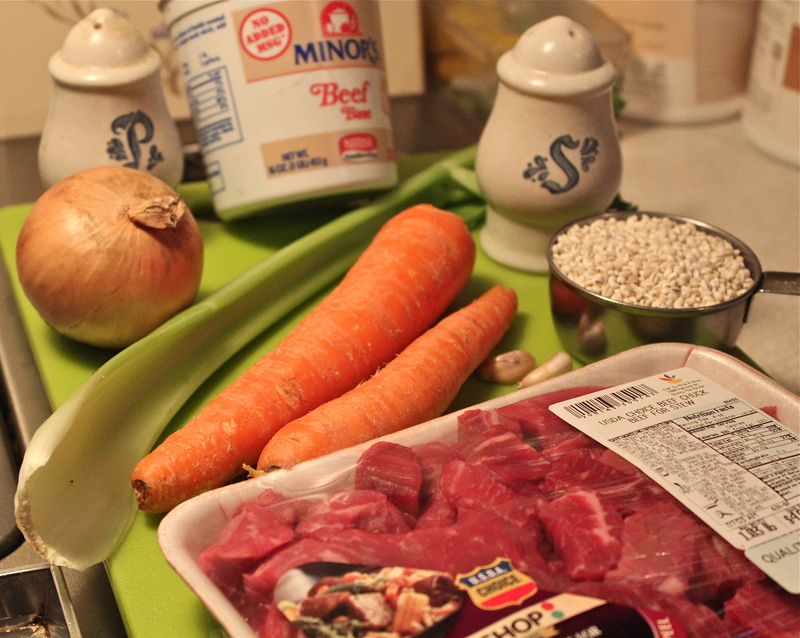 And as you can probably guess I’m making…..soup! This is excellent, excellent soup. If you like mushrooms and you like barley, this combination in a soup can’t be beat. It’s very easy and economical to make and only takes about an hour. This is a hearty soup with rich depth of flavor. It’s even better the next day. If it thickens up too much you can always add a little water or more broth. I used two kinds of mushrooms; baby bella(s) and porcinis that I cut rather thick, so biting into them is like eating meat. The flavor is outstanding!! Be sure to taste before adding salt as broth will have some salt in it, even if it’s lower in sodium. I thought that the 1/4 cup olive oil was a bit too much so only used about half that amount, and the veggies sautéd just fine. 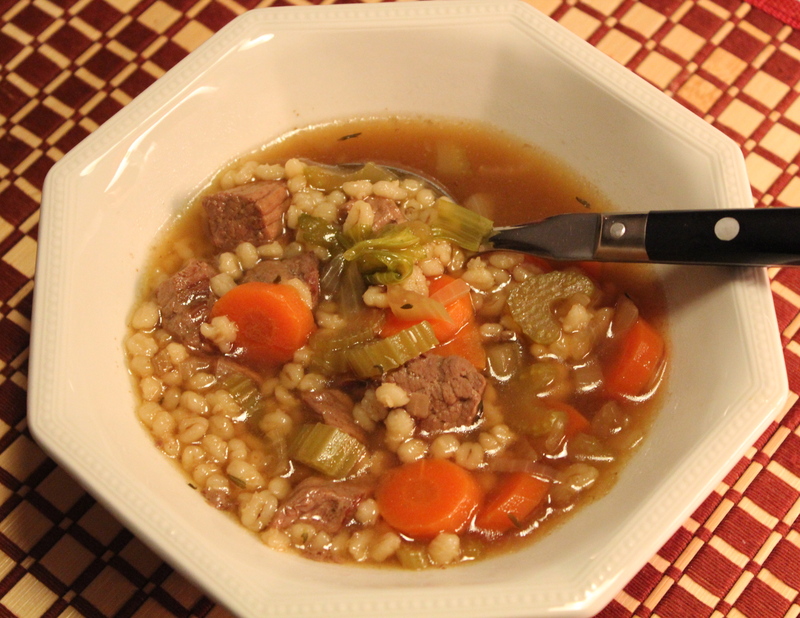 If you use regular barley instead of pearled, it will cook quicker if you soak it overnight. Pearled barley cooks in about an hour or a little more. When making soup it’s always best to plan a little extra time, but keep it 98% covered so the broth doesn’t evaporate away while it simmers. 1. Heat oil in a large soup kettle over medium heat. 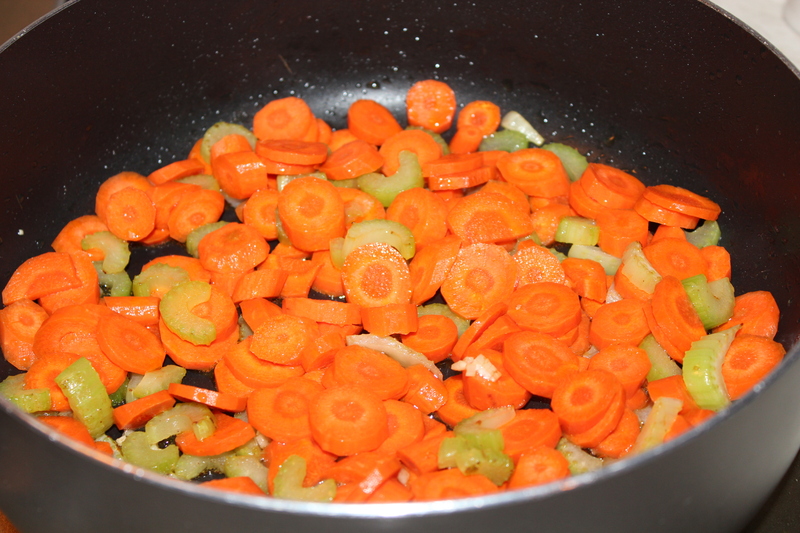 Add the onion, carrots, celery and garlic; cook and stir until onions are tender and transparent. Saute the veggies in a little olive oil. 2. Stir in mushrooms and continue to cook for a few minutes longer. 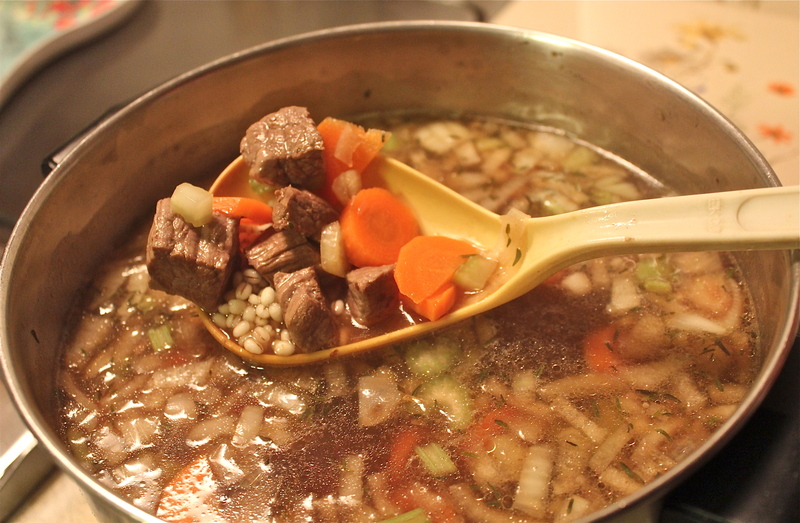 Pour in the beef broth and add the barley and thyme. 3. Bring to a boil, then reduce heat to low. Cover and keep at a low simmer until barley is tender, about 50 – 60 minutes. Season with salt and pepper as needed before serving. Hearty and delicious. Full of umami flavor! 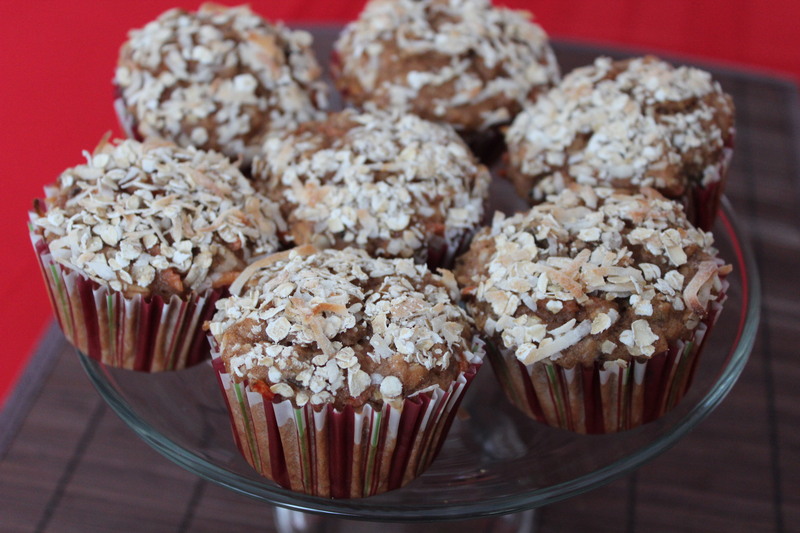 These carrot-flecked whole-grain muffins can be made ahead so you can hit the floor running on a busy morning. Add a non-fat latte and your day will be off to a healthy start. Assemble the ingredients and they go together quickly. 2. Whisk whole-wheat flour, 1/2 cup oats, baking powder, cinnamon, salt and allspice in a medium bowl. 3. Whisk eggs, applesauce, honey and vanilla in a large bowl. Whisk in oil. Gently stir in the flour mixture just until moistened. 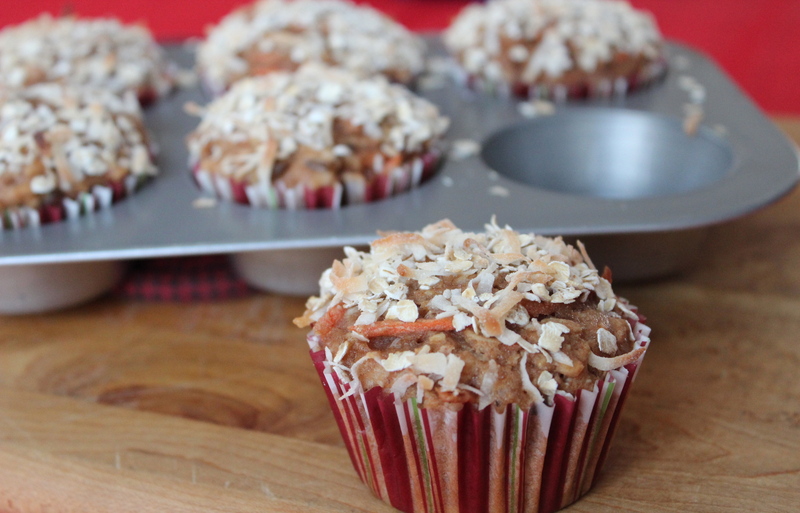 Fold in carrots, 1/2 cup coconut, raisins and nuts, if using. 4. Divide the batter among the muffin cups. 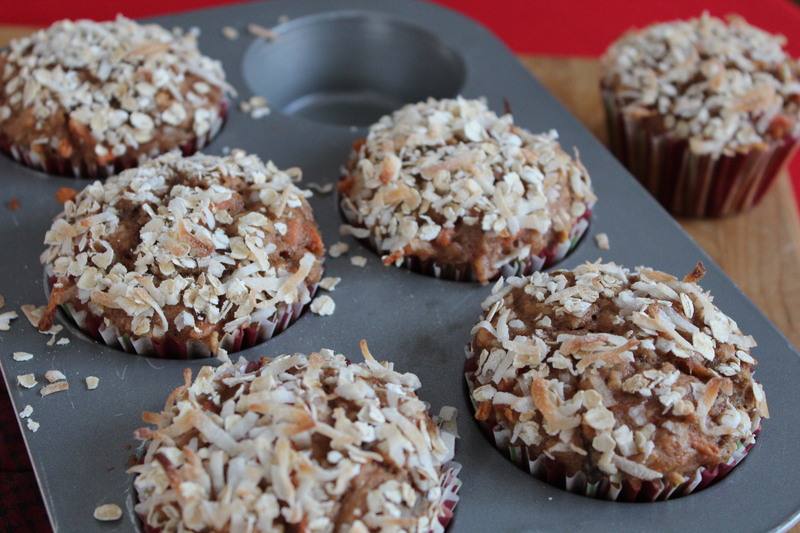 Mix together the remaining oats, and coconut. 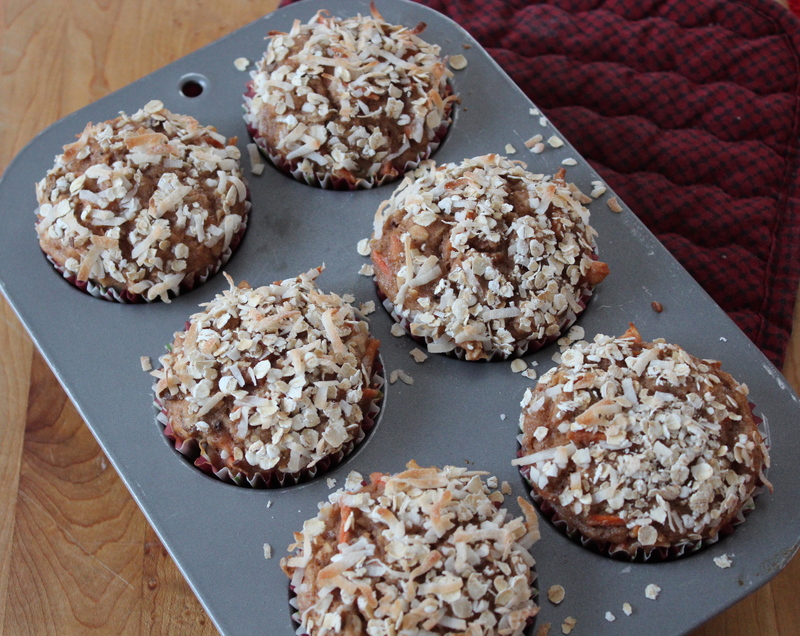 Sprinkle on muffin tops. 5. Bake at 350* until they spring back when lightly touched and a toothpick inserted in the center comes out with only moist crumbs attached, 30 – 35 minutes. Let cool in the pan for 10 minutes before turning out onto a wire rack. Serve warm or at room temperature. Delicious as they are when first made and eaten warm, they also seem to improve over night and taste even better the next day, when flavors have had time to blend. Charlotte, not-so-sweet Charlotte! She’s been here and gone, but not without leaving her mark. I saw a cartoon that was a map of the state of Ct. with these words written across it: “CLOSED, come back later.” Many roads are still not plowed, businesses that are open have only a few people who can get in, the rest are still snowbound. Thousands of people have no power. Thankfully we are not one of them. We are homebound, snowbound, and almost but not quite bored. There are tons of things I could do, but somehow nothing I can think of appeals to me. Mr. D. is home because his office is closed, and of course we need to eat. So in spite of having a “bucket of books” to read and many issues of magazines to catch up on, knitting and other projects to work on, the one thing I can really get in to is to cook something. This is a picture of our deck. 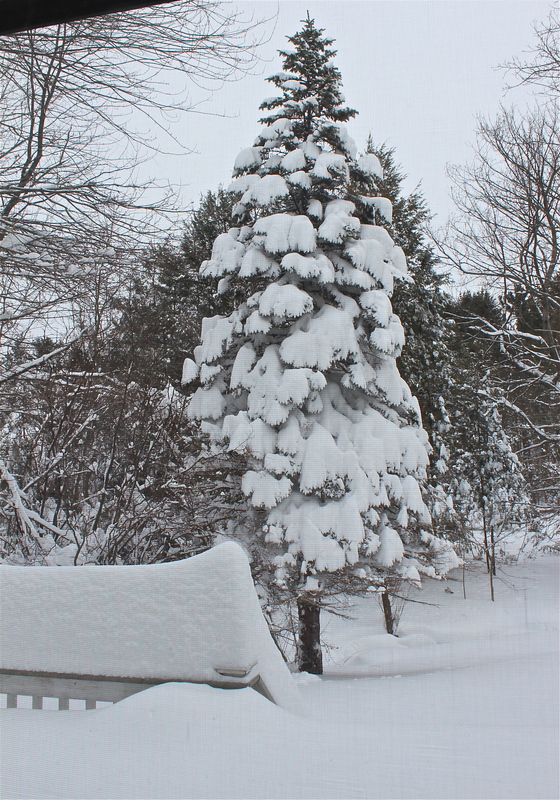 The snow is at least 3 feet deep. 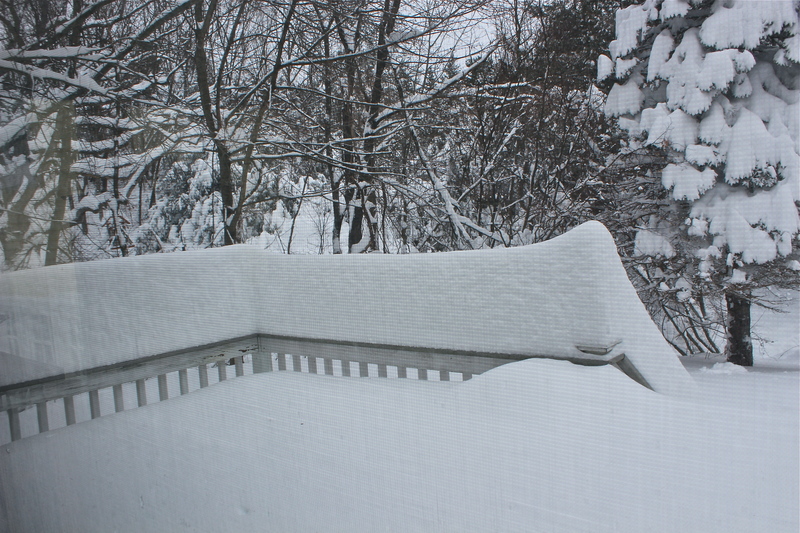 We cannot open the back door out onto the deck. This is our lower patio. 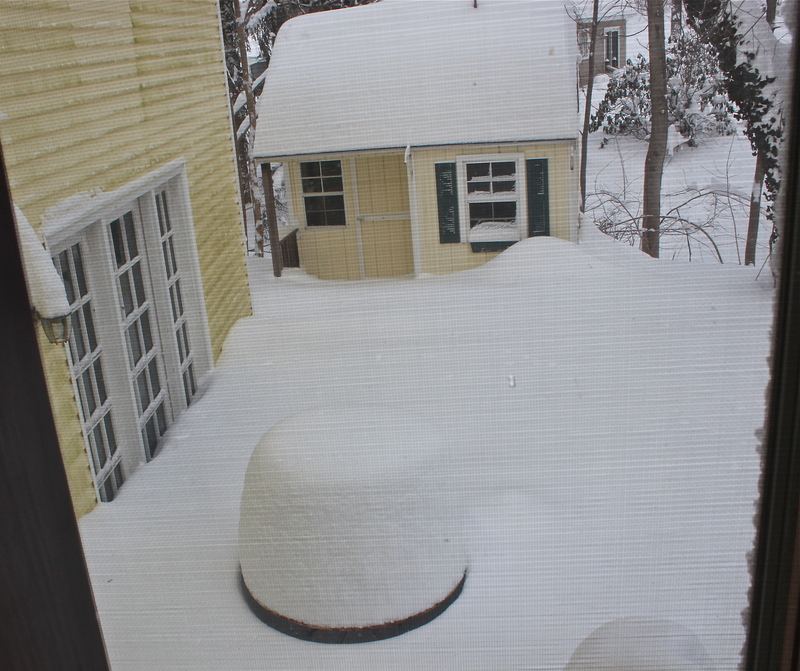 What looks like a giant marshmallow is a table with that much snow on it. Storms days usually make me think of soup and today is no exception. 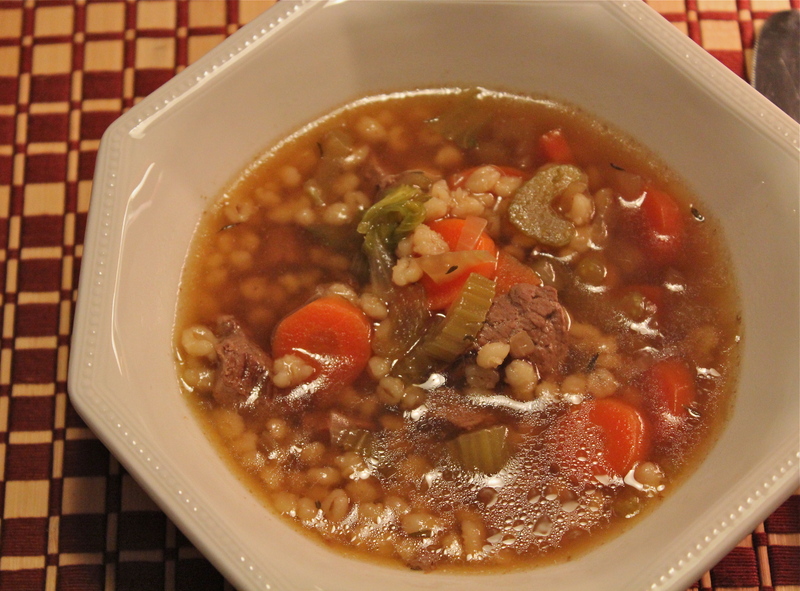 Today’s soup is a beef and barley combination. It is only in recent years that I have begun to use barley. I don’t recall ever having it in my growing up years, and so when I began to cook for my family it is not one of the ingredients I used. Then one day a soup recipe caught my eye but it contained barley. I purchased some knowing it is a good source of fiber and low on the glycemic scale, so I gave it a try. I was pleasantly surprised by its nutty flavor and how much it thickened the soup. 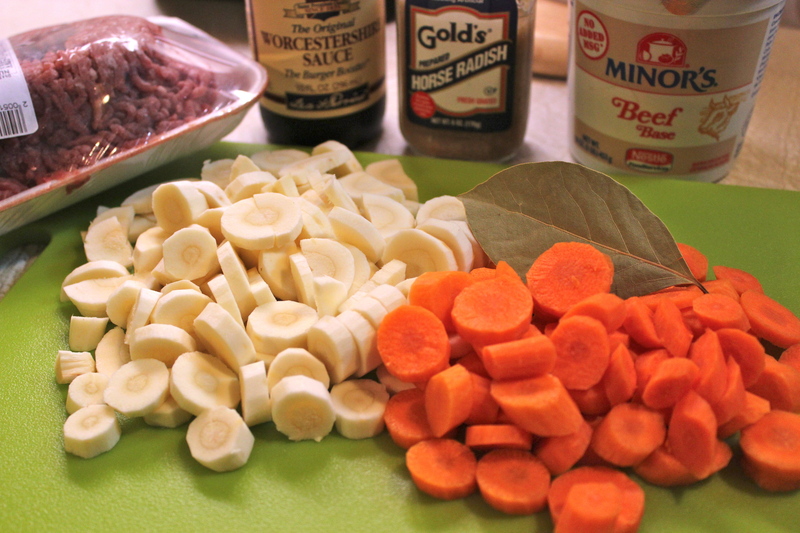 Now I would not make a beef soup without it, and sometimes I include mushrooms with it. Not today, though, since I didn’t have any on hand, and I couldn’t go out to get some if I wanted to. As I assembled all the ingredients and began to prep the vegetables, and brown the meat, it occurred to me that I was following the very same steps you take when you make a braise. Braising is a technique that is used on tougher cuts of meat to produce great flavor and tenderness. Its a cook’s secret weapon and one that I use frequently to prepare the basic ingredients for soup, or to slow cook a piece of meat that will become fork tender and falling off the bone. It is very easy to do if you remember four simple steps that I describe in the recipe below. If you’re looking for a way to dial up your cooking skills, braising is a secret you need to be in on. In my opinion there is no other technique that requires so little of you and yet gives so much back. Just don’t tell everyone, OK? Assemble and prep the meat and vegetables in advance. 1. 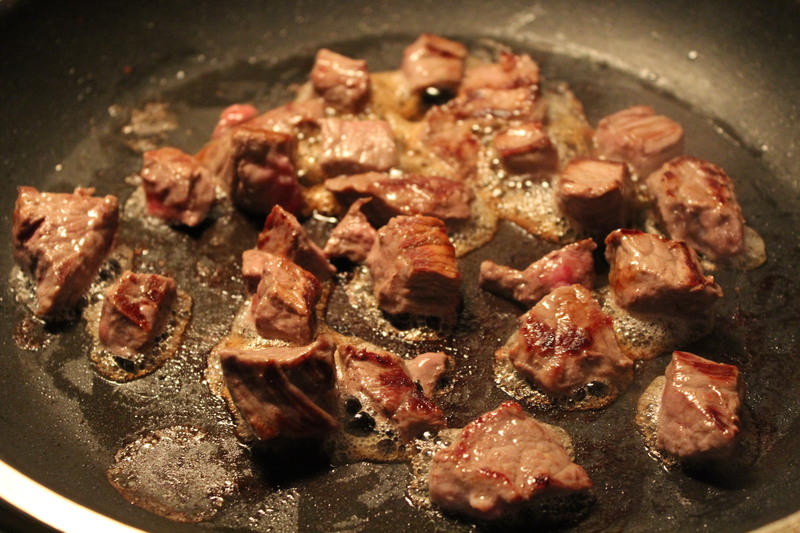 Sear the meat: In a large skillet or Dutch oven, heat the oil. Season the meat with salt and pepper and brown the beef, in batches if necessary. Don’t crowd the pan, take the time to get good browning all over. Transfer to a large soup kettle. Sear the meat in small batches. That’s where the good flavor comes from. 2. 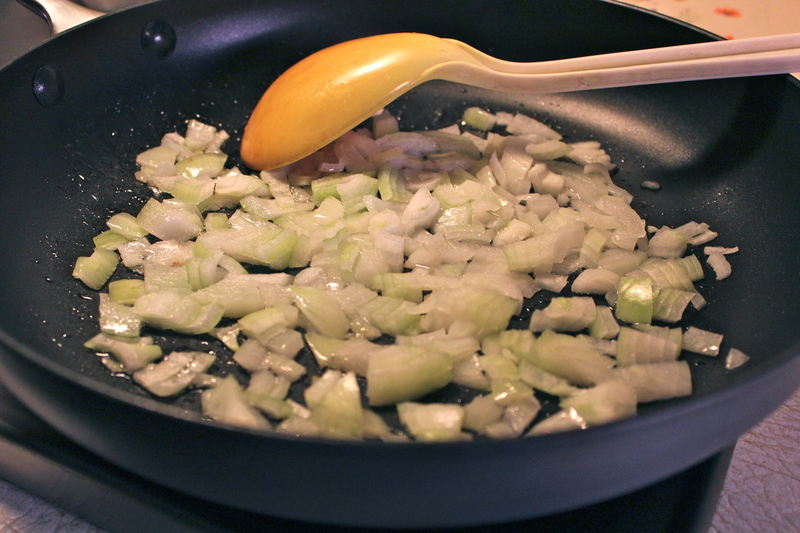 Saute the mirepoix. This is a French term meaning the classic onion, carrots, and celery combo. 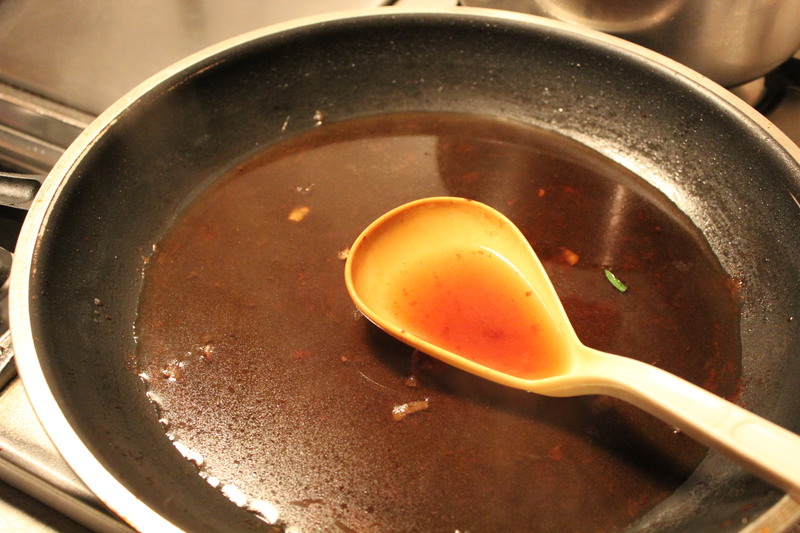 Add chopped onions and celery to drippings left in the skillet, and brown them, aiming for a caramel-y brown color. Add onion and celery and get everything browned. Add in the minced garlic, and the flour. Cook for 1 minute, then transfer to the soup kettle. In this recipe the carrots are added later as they are part of the main ingredients of the soup. 3. Deglaze the pan. Pour a small amount of the beef broth into the skillet to deglaze the pan and scrape up all the browned bits. These bits are flavor bombs. When they dissolve in the cooking liquid, they enrich the whole dish. Deglaze the pan with some of the beef broth. Add this to the soup kettle with the remaining beef broth, the 5 cups of water, salt, thyme and pepper. 4. Braise it. Bring to a boil. Meanwhile peel and slice the carrots. Add them to the soup kettle with the barley. When the mixture comes to a boil, reduce the heat to low, cover with tipped cover and simmer for 1 1/2 hours. 5. In the last half hour of cooking, I like to add some fresh mushrooms. They seem to add to the deep beefy flavor of this hearty soup. A warming bowl of soup. So Good! In the days before food processors, making coleslaw was a laborious task involving cutting the cabbage with a knife. In my growing up years I was very used to having coleslaw that was cut extremely fine, and mixed with a dressing consisting of mayonnaise, thinned with a little vinegar or pickle juice. I had an aunt who was my mother’s sister, and she spent a great deal of time at our house. One of her special skills was cutting the cabbage for coleslaw. She removed the hard rib from each leaf, tightly rolled up the leaf (like a cigar), and cross cut it into very fine shreds. She thought nothing of spending an hour or more doing this, and it was her contribution to dinner. I share this story with you so you will know that where coleslaw is concerned I am very ” spoiled”. I like it shredded very thin therefore, I rarely use packaged coleslaw mixes. My solution to getting cabbage shredded thin is to use a plane grater which is adjustable for thickness, and it does a pretty good job of getting the cabbage as thin as I like it. Which brings me to my recipe for today. I cooked fish this past weekend, and I aways think that coleslaw is a good side dish with fish, so I made some. Besides the usual cabbage, mayonnaise and vinegar, this recipe includes shredded carrots, a few stuffed green olives sliced thin, and some parsley for color. The dressing includes garlic, grainy mustard, and sugar. There is such a good balance of flavors that no single one stands out, but together they make a tangy, cool, crunchy, taste sensation. 1. In a large bowl, combine the shredded cabbage, carrot, olives, and parsley; mix well and set aside. 2. Combine the garlic and salt in a mortar and press with a pestle until mixture becomes a paste. Scrape into a small bowl. 3. To the garlic paste, add the mayonnaise, and mix well. Add the vinegar, sugar, and mustard. Mix well with a whisk. Shredded vegetables in one bowl, dressing ingredients, in another. Mix together and chill. 4. Pour dressing over the cabbage mixture and toss to coat. Cover and refrigerate as long as possible before serving. The time allows the flavors to meld, and the cabbage to become crisp. It is best served cold. Finger Foods are obviously foods you can eat with your fingers. No utensils required. This category of foods is actually quite broad if you think about it, covering appetizers, main entree, and dessert. But during this busy holiday season when we were asked to bring “finger foods” to an event, I was initially stumped as to what to bring. The more I thought about it, however, I remembered having a rather unique sandwich at a luncheon that I attended last year. At that event everyone loved these sandwiches and wanted to know how to make them. Get these ingredients together: 1 cup grated carrots, 1 – 8 ounce package cream cheese, 1/2 a can cream cheese frosting, 1/4 cup chopped nuts. 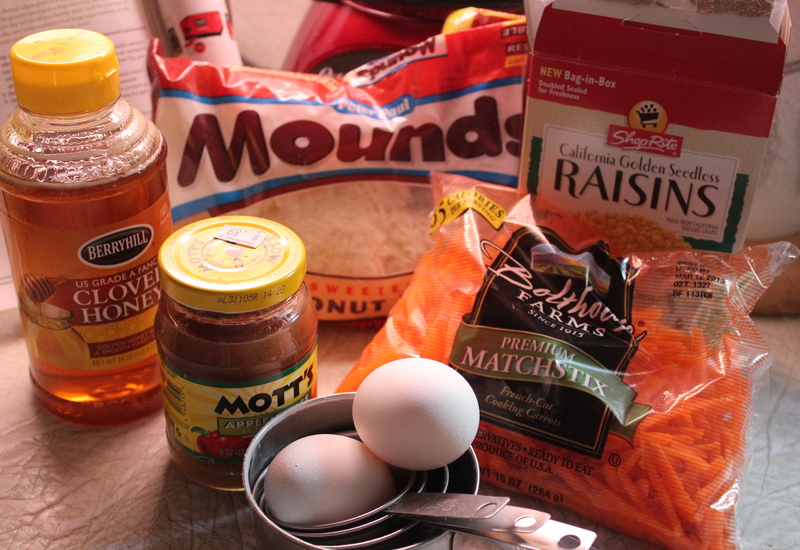 Mix all together and spread on raisin bread. Use a good quality bread such as Peppridge Farms. Whip cream cheese and frosting together to blend. Add chopped nuts and grated carrots. Blend everything together so its creamy and spreadable. Spread filling on raisin bread. Cut into halves or quarters and arrange on a serving plate. EASY. PRETTY. YUM-YUM Good! Cut into quarters and plate up for an attractive presentation. 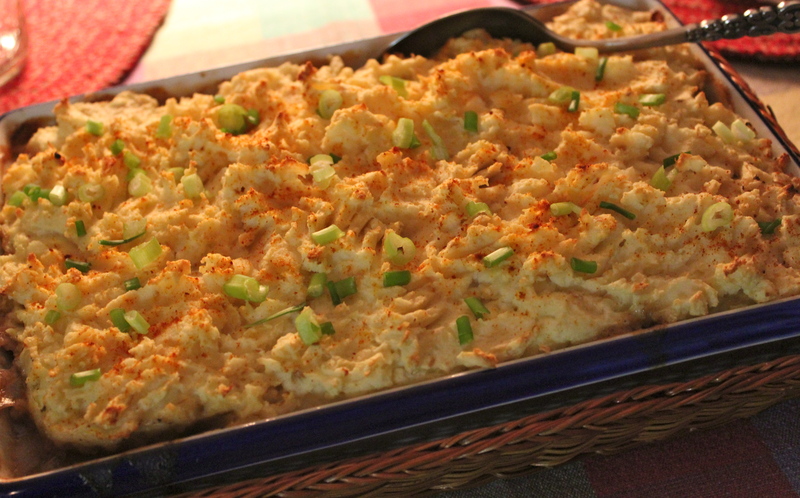 This recipe takes me back–way back–to when I was growing up. 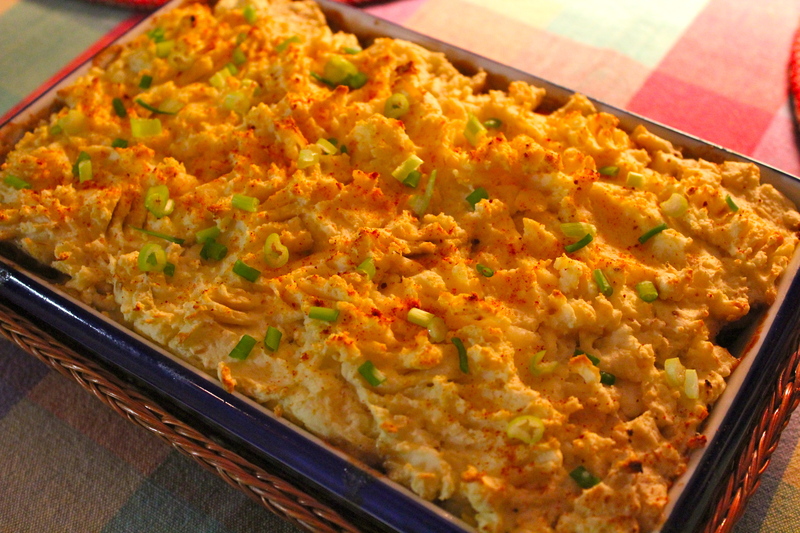 Shepherd’s Pie was a casserole dish that my mother made frequently because it was a favorite of my father’s. He also loved horseradish, and often told my brother and me about how his grandfather grew horseradish, and ground it fresh, so it was really tangy and hot, with no added ingredients to tame it down. So he grew up with a taste for the real thing fresh from the garden. Maybe I have a “gene” for horseradish, inherited from my father. However I came by it, I like it pretty well too, and I use it like relish to garnish some meats(like corned beef), and add it to other dishes just for the flavor it imparts. Mashed potatoes is one of those dishes. So—combine horseradish flavored mashed potatoes with a meat and vegetable pie and you’ve got one deeelish dish. However if the thought of adding horseradish to your mashed potatoes doesn’t appeal to you just leave it out. The other thing this casserole has going for it is parsnips. Yep, parsnips. Not a vegetable that gets a whole lot of press, and that’s a shame because parsnips add a lot of sweetness to whatever they are cooked with, or they are wonderful on their own either roasted or baked. As a matter of fact, I will most likely be cooking parsnips again soon as I now have half a bag to use up after making this dish. 5 baking potatoes, peeled and cut into 1 inch chunks. 1. Place the potatoes in a large pot of cold water and bring to a boil. Salt the water, lower the heat and simmer until fork-tender, about 15 minutes. Drain, then mash with the milk, egg and horseradish, until light and fluffy. Season with salt and pepper. Sautee the onions a little. 2. In a deep, large skillet, heat the olive oil over medium heat. 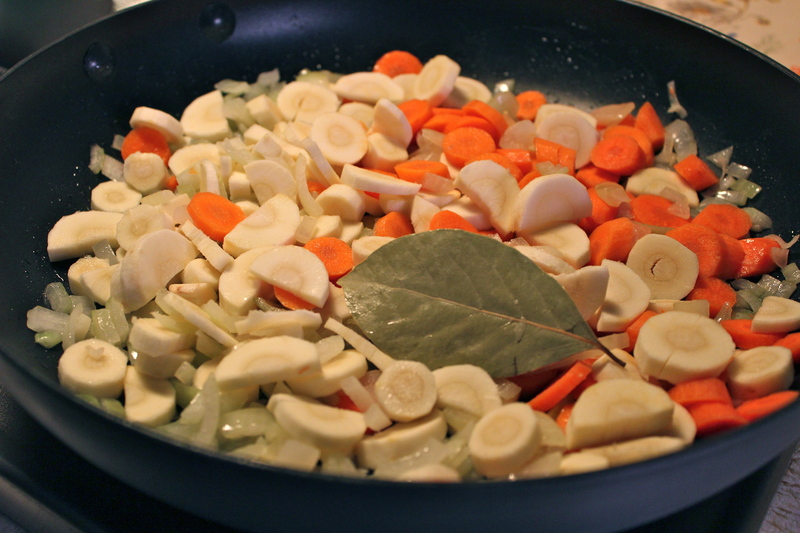 Add the onions, parsnips, carrots and bay leaf. Season with salt and pepper and cook, stirring, until crisp tender, 8 – 10 minutes. Add carrots, parsnip and bay leaf. 3. Crumble the beef into the pan and cook, stirring often, for 5 minutes. Sprinkle on the flour and cook, stirring for 1 minute. Crumble in the beef, then sprinkle flour over the top. Stir in the beef broth and cook until thickened, 1 to 2 minutes. 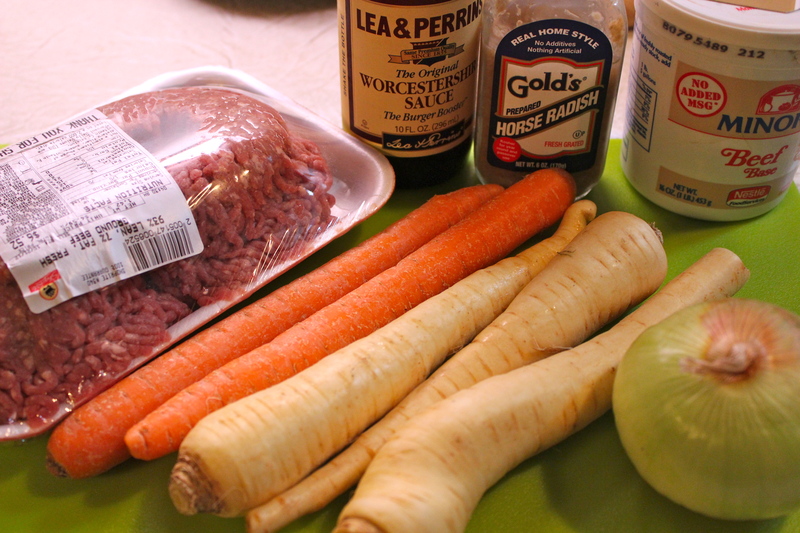 Season with Worcestershire sauce. Taste and adjust seasonings, adding salt and pepper as needed. Discard the bay leaf. 4. Preheat the oven to 450 degrees. Grease a shallow, medium casserole dish; add the meat mixture and top with the mashed potatoes. Bake until golden and heated through. Sprinkle chives or green onions on top before serving. Hot out of the oven, ready to be served. I made this dish recently to share with a friend of ours who had undergone surgery, and was recuperating at home with no-one to cook for him. I chose to make this because the recipe makes a large quantity and could easily be split for him and for us. Its one of my favorites to make whenever I’m called upon to help out in this way. Everyone who has it always comments on how flavorful it is with its mixture of vegetables and chicken. Leftovers seem to taste as good if not better the second time around. I first wrote about this recipe back in April when I was new to writing this blog, and less experienced with my photography. Having tweaked the recipe a bit since then I thought it was worth presenting again for those of you who may not have seen it. 1 broiler-fryer chicken, cut up; or chicken parts to equal 3-4 pounds. 2 cans ( 15 1/2 ounces each) beans, rinsed and drained. These may be black beans, or any white beans. 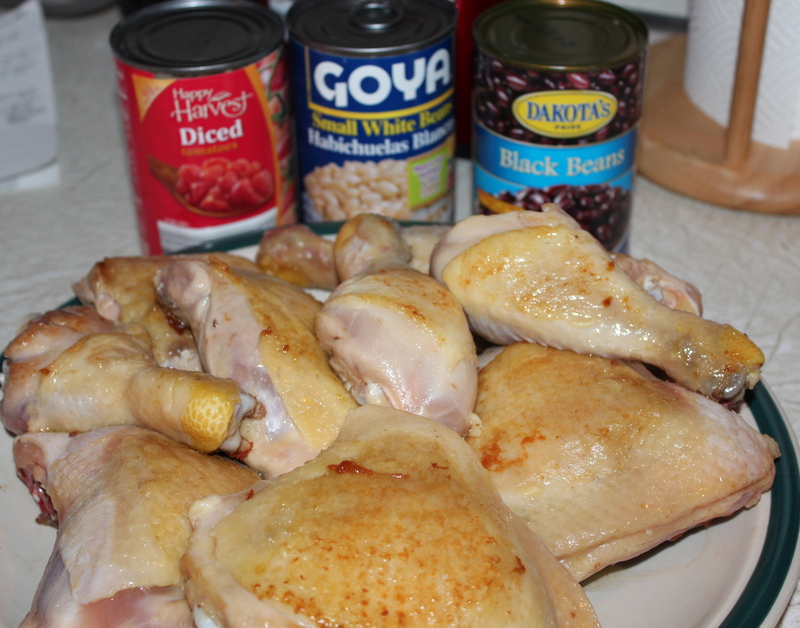 My preference is to use 1 can white beans and 1 can black. 1. In a large skillet drizzle the olive oil and heat to very hot, add the chicken skin side down and cook just to brown, turn over and continue browning. Remove to a platter and set aside. Saute the raw vegetables in pan drippings. 2. 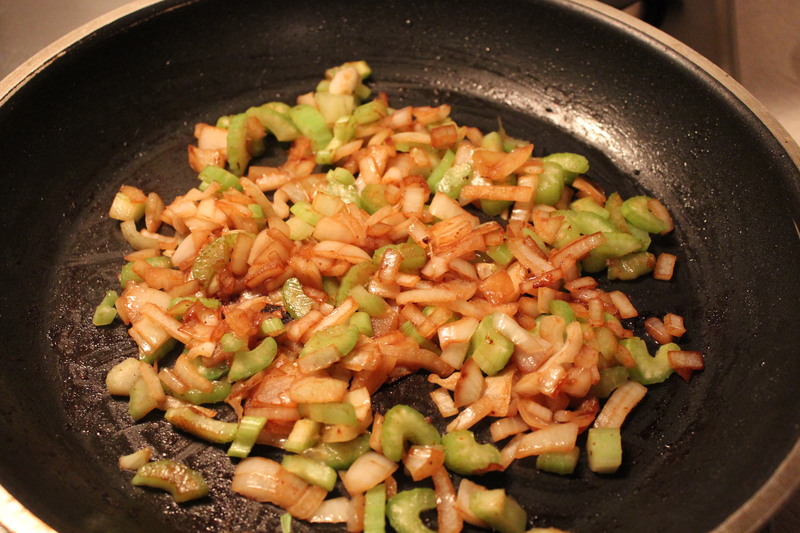 In the pan drippings, sauté onion, garlic and celery until tender. Stir in carrots and continue to sauté for another minute. 3. 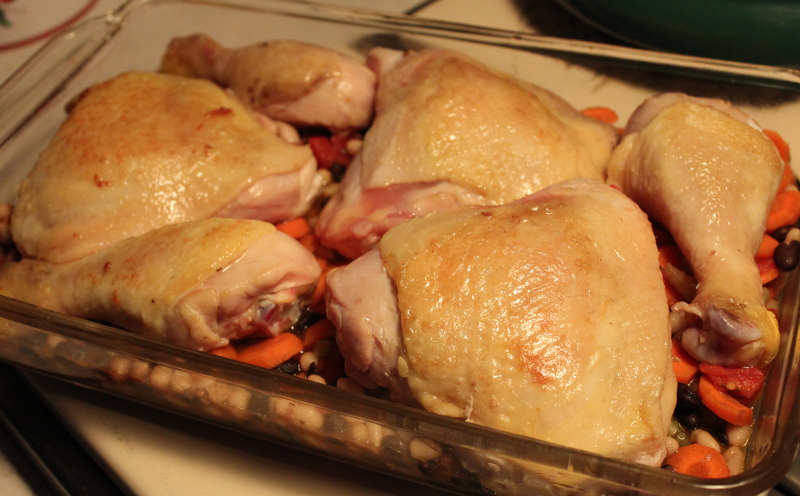 Spoon into a 3-quart baking dish; arrange the chicken pieces on top. 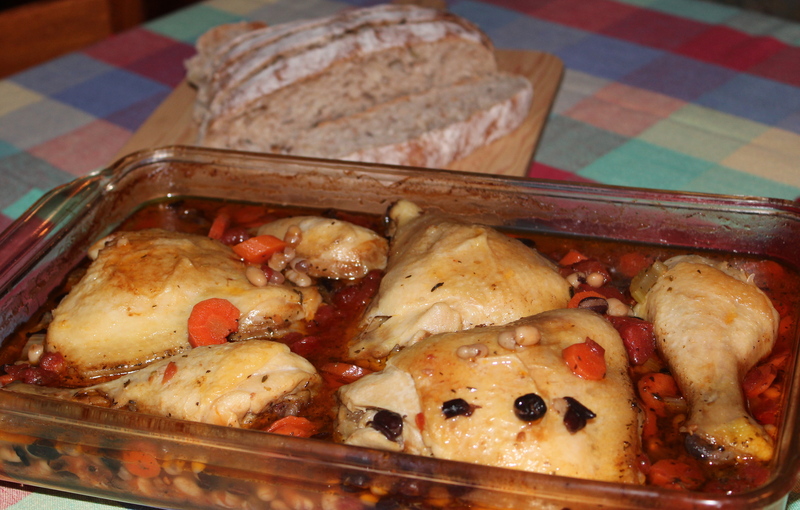 Cover with foil and bake at 350 degrees for 65 – 75 minutes or until chicken juices run clear. I have served this entree at a dinner party to rave reviews. What I like about it is the amount of time you have to serve appetizers and visit with your guests while it bakes. Have a salad made in advance and maybe a loaf of crusty bread to go with it and you will be a hero without a whole lot of effort. Here we are at the middle of June and the weather this week has been overcast and quite cool. This put me in the mood for a warm bowl of soup. Not a thick, hearty one but something rather light, yet filling and containing healthy ingredients. 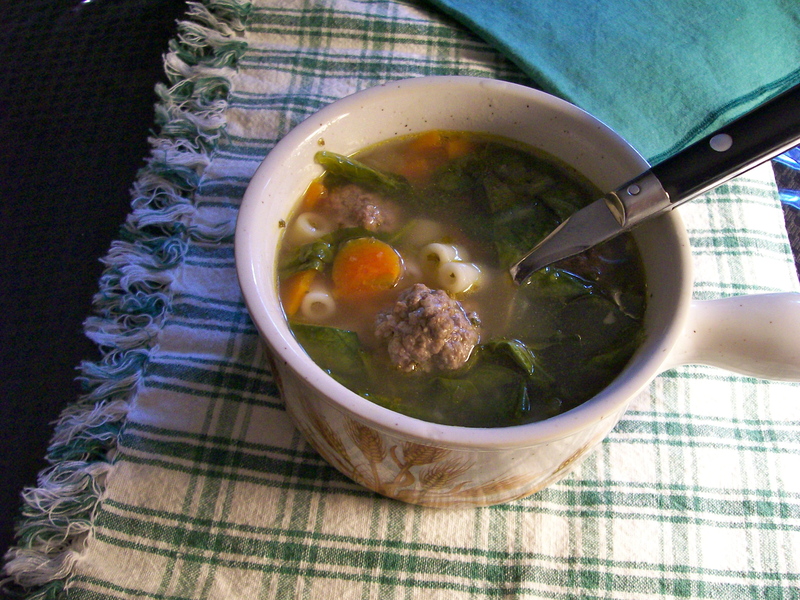 The one that came to mind is this recipe for Italian Wedding soup. 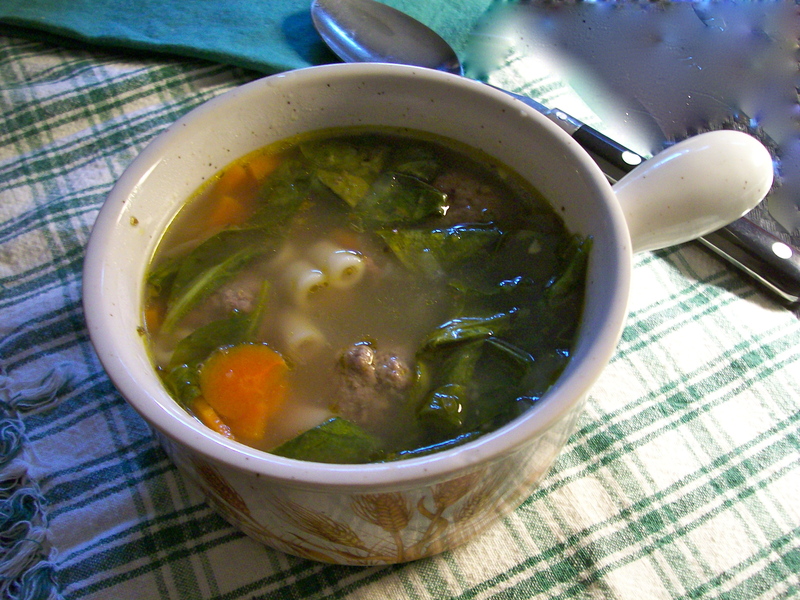 A chicken broth base, with carrots, tiny pasta, beef meatballs and spinach, it was just what I wanted. A quick side note: I always assumed it was so named because it was served at Italian weddings. HaHa! My friend Pauline who is Italian by heritage straightened me out on that one. She says it gets its name from the fact that it is a marriage of beef meatballs with chicken stock, a wedding of sorts. So—now we know. 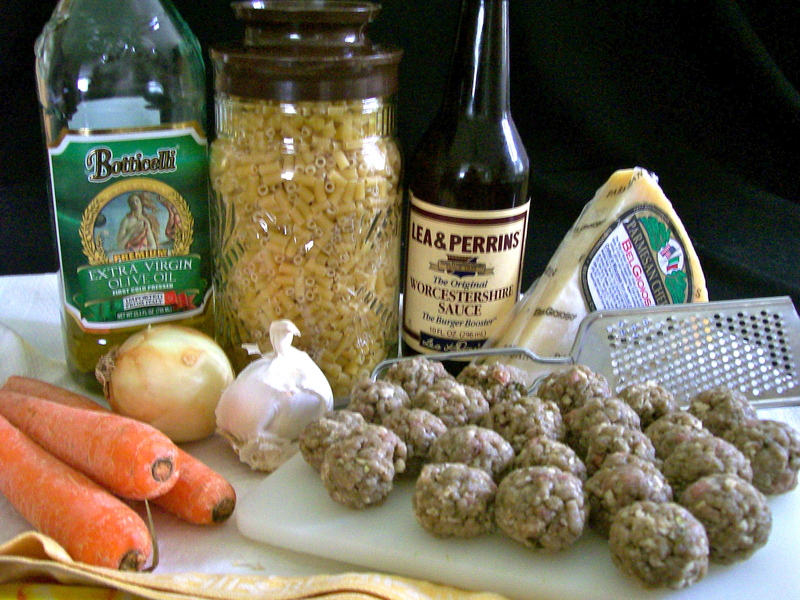 I usually start this recipe by making the meatballs first, putting them on a platter or tray in the refrigerator while I begin the actual soup-making……then when I need the meatballs they are all ready. In fact they could be made a day in advance and kept cold so you save time on the day you make the soup, since this is what takes the most time. 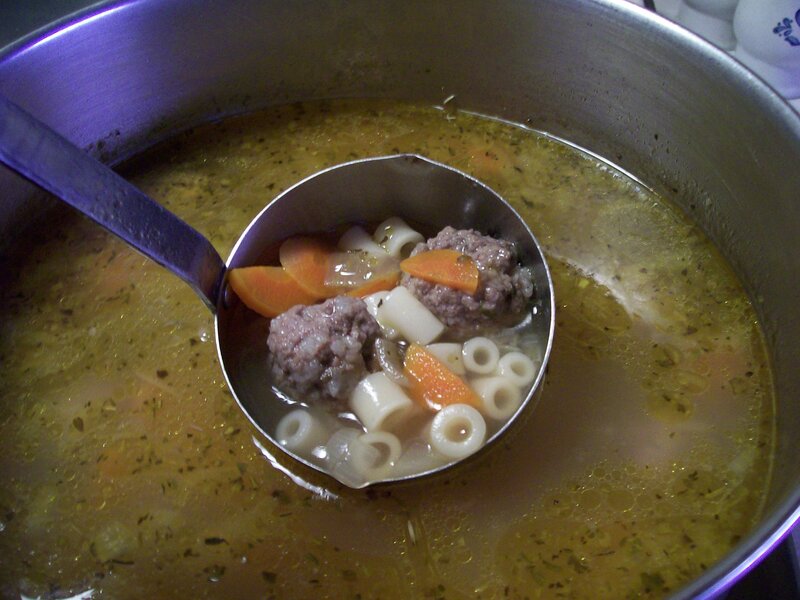 With the meatballs all made, it takes less than an hour to make the soup. Now let’s get started. In a medium bowl mix together the milk, egg, salt, breadcrumbs, and seasonings. 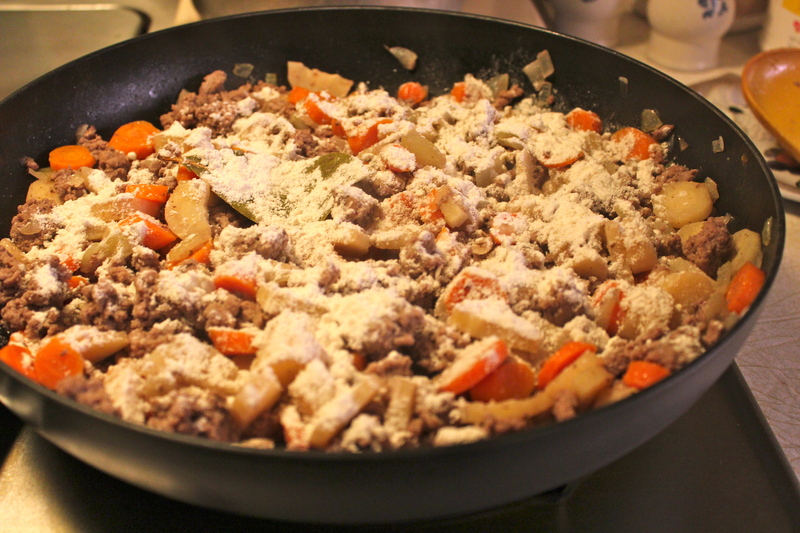 Crumble and add the ground beef. Gently mix with the other ingredients. With your hands, form into tiny meatballs, about 1 inch in diameter. It’s helpful to moisten your hands occasionally while doing this—-the meatballs seem to stick together better. In a large soup kettle, sauté the onion and carrots in the olive oil, just till onion is translucent. Add garlic and sauté another minute. Add the chicken broth and herbs; Bring to a boil, cover, and reduce heat to medium and simmer till vegetables are tender. Add the pasta, bringing soup back up to boil, simmer about 10 minutes. Add the meatballs and cook until they are firm and float to the top, about 4-5 minutes. Stir in the spinach and cook until wilted, if using fresh, or warmed through if using frozen. Taste and adjust seasoning with salt and pepper as needed. Ladle soup into serving bowls and top with grated parmesan cheese. Oh, yeah! This is good stuff! SOURCE: Pauline’s recipe with slight modifications by yours truly.